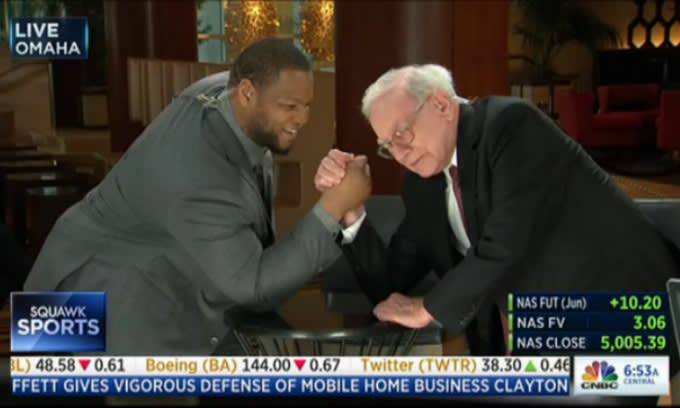 We&apos;re gonna go out on a limb here and say that Warren Buffett is most likely not stronger than Ndamukong Suh. In fact, if CNBC had asked Suh to bench press Buffett a bunch of times on their show Squak Box this morning, Suh probably would have been able to toss him into the air, like, 57 times. But CNBC or, more specifically, Buffett didn&apos;t ask Suh to do that. Instead, he asked Suh to arm wrestle and, well, Suh is apparently smart enough to know that you don&apos;t beat one of the most powerful men in the world in a nationally-televised arm wrestling match if he challenges you to one. Suh has been friendly with Buffett for a few years now and, from the sound of things, he&apos;s trying to learn about the business world from him. So taking an L here was definitely a smart move.